Rich and Fluffy Easter Angel Cake with Sarah Bernhardt Fruit and Chantilly Cream | Bake This Cake! Presenting an old-fashioned charmer that’s fluffy and moist, this historic angel food cake contains a tender sunshine surprise that reveals itself only when you slice it. Serve it up with a vintage compote of sweet wine strawberries, fresh pineapple chunks and a dollop of strawberry Chantilly. You may also add a scoop of homemade vanilla ice cream to the mix to create a homemade springtime flavor party. 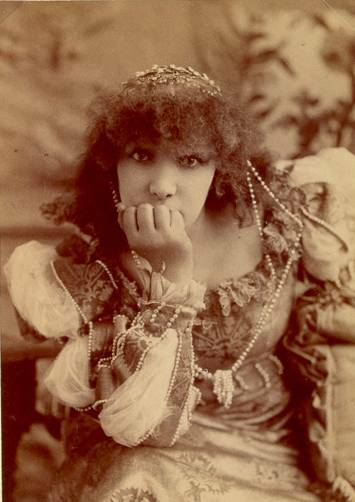 French stage actress Sarah Bernhardt, 1890. 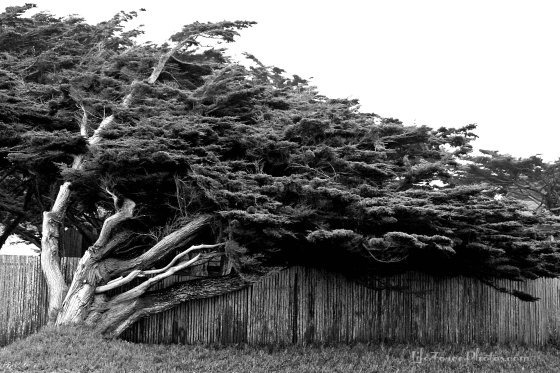 Photograph by Napoleon Sarony. Sarah’s Fruit and Cream: Instead of frosting the cake, we visited the wayback machine for an historic stand-alone fruit dessert. We’re using this over-the-top “sunset dessert” as the triple-powered cake topping. 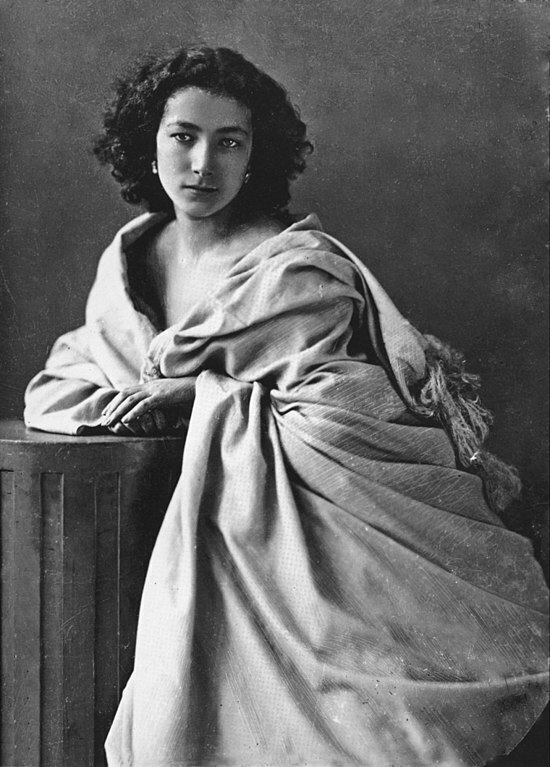 It was invented by the dramatic and revered turn-of-the-century actor, Sarah Bernhardt. (Click >here< to see a short 1912 video clip of her silent film skills.) You’ll need some fresh strawberries, a fresh pineapple, a little sweet red wine and some whipping cream to make this fruited compote topping. Auguste Escoffier discusses “Fraises a la Sarah Bernhardt” (“fraises” meaning strawberries, in his memoir, “Memories of My Life“, 1985, translated 1996) that calls for “greenhouse strawberries”, fresh pineapple and a splash of Vielle Cure (no longer produced but previously bottled as a French herbal liqueur (with 50+ herbs) in a base of Armagnac & Cognac). The fruit and cream, layered over vanilla ice cream, is meant to give the illusion of a beautiful sunset. I used a big basket of strawberries and a drizzle of Italian Marsala sweet wine (left over from a Zabaglione custard sauce for the Hot Chocolate Souffle Cake). So many fruit and liqueur options work well for this macerated overnight delight – so feel free to experiement with different fruits or liquers. Since I was on the move with this party cake, I had to leave the vanilla ice cream at home. But please top off a cute little slice of this vintage cake with a scoop of ice cream before layering on the fresh fruit and cream. Wonderment will result with a beautimous spring cake creation. Recipe Change-up: We’ve dipped deep into an old stack of newspapers for this holiday charmer – direct from the pages of the Syracuse Herald on Mar 23, 1932. We changed up the original recipe only to add one-half more of all the ingredients for that high-top, fluffy angel food cake that we all love and expect (the original recipe makes a great but smaller cake). Okay, we also reduced the oven temperature for a nice, slow bake. SLOW FOOD WARNING: This cake is not hard to make, although you need to make 2 separate batters (yellow and white), separate a bunch of eggs, sift the flour a few times, use a little bit of boiling water and a fine quality natural lemon extract to make a go of it. The Sarah Bernhardt strawberry topping requires an overnight refrigerator soak and you should cut up a fresh whole pineapple to get those fresh sunshine flavors rockin’. So set aside some time from your busy schedule to give your gift-of-time-cake some elbow move. I’ve made this cake at least four times so far in different variations to get it just right. So I will present it here in our final “all thumbs up” winning round. We even served it to “the pros” at a recent Food Bloggers Los Angeles (FBLA) event to be sure it was in tip-top shape. Set the center oven rack to center postion and preheat the oven to 350 degrees. Tip: I’m not a fan of sifting, but I recommend multiple siftings for the lightest cake results. Spoon the white batter into the bottom of an ungreased spring form tube pan and spread the top to smooth it level. Set it aside while you work on the yellow batter. Put a small tea kettle on to boil or place a cup of hot water in the microwave and bring to a boil while you prepare the next steps for the yellow batter. Spoon the yellow batter over the center top of the white batter, leaving the white batter showing at the sides and center of the tube pan. Using a knife, gently run the knife through the center of the yellow batter so that the yellow batter drops slightly into the white batter. Tip: The yellow batter is heavier than the white batter so it will naturally sink a little into the center of the cake. Smooth the top of the cake batter and use a toothpick to pop any large bubbles showing on the top of the batter. Place the cake on the center rack of the pre-heated oven and bake at 350 degrees for approximately 60 minutes. Tip: Place some ice cubes in a separate baking pan in the oven with the cake to create a steamy little oven environment. Remove the cake and let it cool upside down for about an hour. Refrigerate prepared strawberries in a sealed container for 4 hours (or overnight for best results). Skin, core and dice the pineapple. (Click >here< for pineapple cutting directions.) Refrigerate the chopped fresh fruit in a sealed glass or plastic container for 4 hours (or overnight for best results). Store the Strawberry Chantilly Cream in a covered container in the refrigerator until serving time. Happy spring time to you and to your friends and family. Thank you for your kind comments and for your tips regarding your vintage baking adventures. Please consider joining us on Instagram for daily photos and on Pinterest for inspiration sharing. I love angel food cake! I haven’t seen anything like this before… true wonderment! I love how you accessorized it. Thank you! So glad you like it. It has become a personal favorite of mine these days.